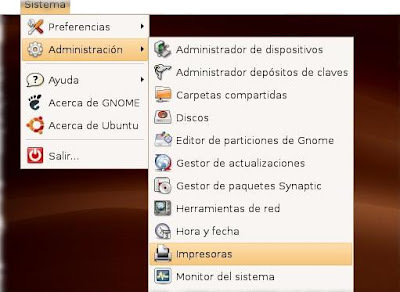 Learn here how install the ubuntu driver printer, if you have any other cuestions please write a coment. Ubuntu is an operating system that uses as its source Linux kernel and it is based on Debian. This is an open system for use by people with medium or high knowledge of computer, it is a system with many facilities and excellent graphics, and it allows us to download a lot of free programs and a console to update them easily. With this operating system we can install the drivers easily than you can imagine, because only by connecting our printer, turning it on and following the steps we will have our printer running and doing most of the functions we can do with other operating system. Below we present the procedure for installation it is also advisable always do a short reading of the documentation supplied by the manufacturer of the printer "manual", in most cases they supplied drivers and installation procedure for this operating system. In case of not having this documentation provided by the printer manufacturer follow the steps below. We verified that our printer is turned on and connected to the computer, when we make a confirmation of this information, go to System - Administration – we open Printers and Print Management. Double-click on New Printer to start the installation. We follow the process and wizard will seek the printer automatically, it will display the printers that are connected to our computer. There is the possibility that the printer is not detected by the wizard, to do this we must start a manual selection process on printers updated in the system, for this we will have to follow the process and select the port where the printer is connected usually we connect our printer through a USB port, then we have to select the printer manufacturer, and then the printer model. You can change any printer information such as the name that you want the printer has the printing moment, and you can make a default thereof, it is recommended to do a test page after installation in this way will be more secure that the printer is working perfectly.